After some small touring with Kid Ink and Chris Webby, and the release of his most recent mixtape "Elmhurst Since Birth", J. Gillie is finally starting to get the recognition he deserves. Industry All Access even dubbed him as "Delaware's Hottest Star". J. Gillie truly has a one of a kind flow and a gift for story telling. His originality has paved a nice path for other inspiring Emcees behind him. Iko The Rainman wears many hats in HipHop, from artist, to comedian, and writer. He created his alias "OPERATION 5:AM", often abbreviated as OP5 or OP5TV, which eventually became the alias name for his crew. "Broly The Super Saiyan Time Bomb" is the second single off of "Tales From The Attic" which is a sequel to the first project "Basement Musik". The evolution of HipHop is upon us, get prepare to take REal HipHop back from the corporations major corporations that own them. It's artist like these they help us break mediocrity of the genre of music I love. 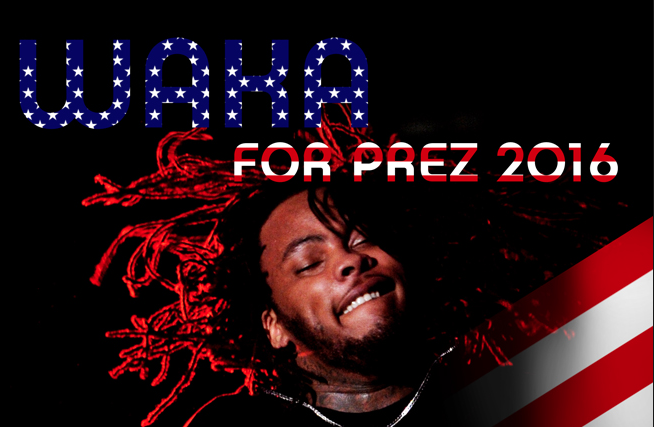 Let me be the first to admit, I'm NOT a huge fan of Waka Flocka's music. His genre of HipHop doesn't consist of enough dope lyrical content for my taste. That being said I've always respected him as a man and how intelligent his perspective is outside of HipHop. The crew at Sway In The Morning just got some jewels dropped on them by The God, Waka. Killa Kyleon takes it old school with his latest #30Days30Deaths video, "So What You Sayin." The Team Run It Emcee once again links with video director David Stunts for another set of creative visuals, this one serving as an ode to EPMD and Yo! MTV Raps. Most rappers do not pay homage to the Gods that created the platform for HipHop, Killa is not one of those Emcees. Make sure y'all support REal artist who keep the originality and respect alive. "Gotta Hate" is JimmyOnJets third single of 2015, and is one for the books. Featuring all-star performances from New Jersey's own Cash Gotti and Sonic Asaad. This track finds three like-minded artists vibing out in the midst of tension and animosity. With live bass by Frankie Prendergast and a jazzy outro showcasing Patrick Gaeta's swinging drums, this song functions more as an extended jam than a typical single. All production and mixing tasks were handled in-house by JimmyOnJets. Being a 70's baby I was really feeling this concert filled with soulful tracks off Daptone Records Released albums with music from Sharon Jones & The Dap-Kings, The Budos Band, Charles Bradley, Menahan Street Band, The Sugarman 4 and The Como Mamas. The Daptone Roster including these artists will perform at this year’s famous SXSW Festival down in the land of Texas. I sure wish I could be there when it all goes down, so if you like that classic soul music you will appreciate these jewels I'm dropping on you today. As the first official release off Dashius Clay's "Never A Dull Moment" album, "Oh You Mad" serves as an abrasively formal introduction. The red bearded artist has been seen working nonstop on both sides of the fence with some of today's biggest artists. From collecting over half a million plays in just 3 months with his YouTube smash "F*#kin Tonight" with French rapper Swagg Man, to lending a hand on the Diplo x Stitches anthem "Guns Go Off" a few weeks back. It's always good to see a REal artist get rewarded for puttin' in the work. Ackurate was raised in East St. Louis, IL where he started taken interest in HipHop, growing up listening to artist like Mos Def, Elzhi and Pharoahe Monk. His new EP Soul Misfit actually puts him in the same category those Emcees mention before.>With production from Ice Beazy, Ckwnce, Capo, PerC-Wells, & MooN ShynE along with some serious lyrical features from his sister Jane G33, E.D.G.E, Motion Plus, A.Saxon, and Beau Willie. What I probably like the most about this joint is there is no "Trapp" tracks on this LP, which is refreshing expecially coming out of St. Lous. Moody Parks is a upcoming artist out of Morrisville, PA, know for his smooth 90's vibe. "Forever Love" was written by Moody and features the soulful vocals of newcomer Hawa. Norwegian beatmaker Navewa does his thing on this joint right here. With the directorial skills of Philadelphia native, Drizzy Dreads this project was able to come alive. Be on the look out for "Sounds of the City", where this song will be featured. ILLClinton which consists of two brothers from Atlanta, Brennan (Artist/Producer) & Blake Belair (Producer) are definitely blazing their own trail instead following the normal trend for Atlanta rappers. This is their first official video for their self-titled single "ILLClinton (Obama)". Their flows are tight along with being lyrically sound and I really like the unique approach with the video concept which was directed by, A Dreamers Visual. ILLClinton's Debut Mixtape, "ILLANTA" is out now make sure you go cop this joint.